If you’ve flown with Russian passengers, there’s every chance you have heard them clap their hands as soon the aircraft touches down. It’s rather a strange custom to foreigners, so Russia Beyond has tried to find out why this happens. Russians have many bizarre habits, such as celebrating New Year at least twice, congratulating each other after having a shower or a bath, smoking under a sign proclaiming "No Smoking," or eating ice cream in the winter. And in all probability a Russian on a plane will start applauding as soon as the aircraft lands. Of course, it’s not just Russians who do this. But there is one difference: If the average European starts clapping after a difficult flight or a happy ending to a dodgy landing, the average Russian will do it in any situation, providing an aircraft doesn't miss the runway all together. This tradition seems silly and a little odd. And some people wonder: Why do it in the first place? You wouldn't applaud a bus driver who has delivered you to your destination. What's the difference?" The first thing that civil aviation pilots will say is that "it’s not the Russians who have taught the rest of the world to applaud, the West started doing it first." Russians started traveling abroad en masse only after the fall of the Iron Curtain in the nineties. There they saw clapping Europeans on flights (Italians are the main suspects) and decided it was the done thing. While many Europeans have already overcome the custom and applaud only after landing in difficult conditions, Russians burst into ovation even after an easy flight. For them it’s rather like saying "thank you" to the chef in a restaurant. Although the pilots do not hear the applause - they are separated from the cabin by an armored door - the cabin crew will tell them about it. Russians are not known for being particularly prone to aerophobia. Still, they are often "people under stress" and for them letting off steam is the best way to deal with this, says psychologist Tatiana Volkova, who works with people suffering from aerophobia. 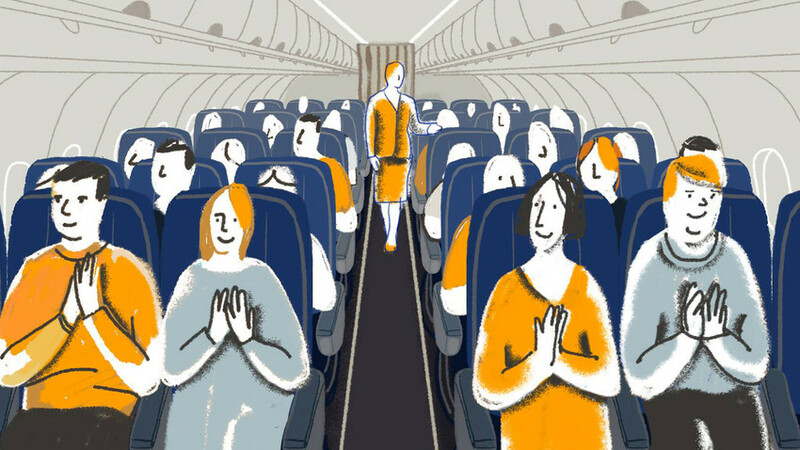 "This explanation is supported by the observation that people who applaud most often are passengers on charter flights. Charter flights are mainly used by people who fly on holiday once or twice a year, and as a result, feel very nervous about flying because they are not used to it," she says. Another theory is that impressionable Russians are still recovering from the shock that airplanes do, unfortunately, sometimes crash. Until the late eighties and early nineties this information had not been widely available and was reported on television or by newspapers. Most often it was not revealed. Glasnost showed the dark side of air travel to Russians, and many now rejoice at the fact that they are still alive after a flight. Despite the statistics on transport-related fatalities (airplanes are the safest), most Russians, if possible, prefer a different form of transport. A total of 69 percent of Russians have not traveled by air at all in the past two or three years (2016 data). A joint Soviet-Italian film, Unbelievable Adventures of Italians in Russia, came out in 1974 and was a hit in the USSR. A crazy scene showing an airliner landing on an ordinary highway with cars traveling down it has embedded itself in the memory of many viewers, and the famous words "Bravo to the Russian pilot" are sometimes loudly recited by passengers as the jet lands. The "Russian mentality” might be to blame. "We are fond of, and used to celebrating even small events, while Europeans regard flights as something more routine," some passengers believe. But what is surprising is that the typical Russian believes that he is safe only after the plane touches down - not during the flight. Terra firma brings them calm and safety. How else does one explain Russians jumping up from their seats and unloading the overhead lockers the moment the jet’s wheels lick the tarmac? Why are Russian tourists so unpopular abroad? Why the USSR failed to send an astronaut to the Moon? Why do people get married in Russia, apart from love?